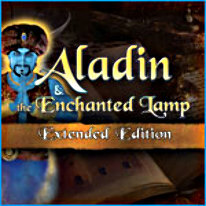 The fabulous tale of Aladdin completely revised! Aladdin is a young orphan. His only wealth lies in his small house and an old ring that formerly belonged to his father. As Aladdin has to steal to survive, he wishes deep inside he will become a rich man, to be worth the Princess Jasmine's attention. A strange dark sorcerer seems to be willing to help him. But in the country of the geniuses, Aladdin will have to act carefully. Look for food, avoid the stallholders, find the marvels' cavern lost in the desert, enjoy the Genius' magic powers and find out what the Palace's mysterious secret is!